This romantic, rural idyl offers you a holiday of discovery and delight. Secluded and unspoilt, it nevertheless offers easy access to excellent local shopping, restaurants and is excellently placed for exploring the region. This magical area of rural France is steeped in history and tradition. The property dates back to the 17th century and once owned extensive farmland for miles around. Its Manor House, Farmhouse and collection of ancient stone barns is full of charm, nestling amongst rolling hills in landscaped parkland. Ancient oak trees, magnificent planting, rare birds, red squirrels and wild orchids provide a haven of peace and wonderful views. The garden is at your disposal and provides masses of space for children to run around and play. The stone built farm house is now fully restored to a luxurious holiday home offering modern comforts, traditional features and beamed ceilings. The house is decorated with light colours throughout, stylish decorations, pictures, quality furniture and some antiques. 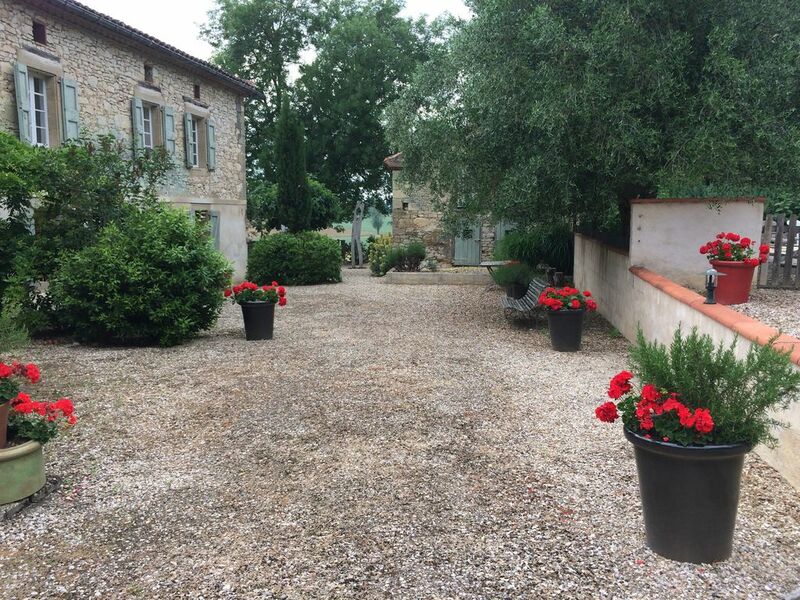 It holds the prestigious Clévacances '4 Keys' classification for a holiday home of character. The house is assessed every 3 years to maintain its standards. The owners live on another part of the site and will provide you with extensive local information and help, but won't intrude on your privacy. The large comfortable sitting room is amply furnished with huge sofas, flat screen TV, DVD player, library of books and games. Plenty of tourist information, maps and guides are provided. Free Wi-fi is included. A log burning stove and oil fired central heating make for cosy low season visits. The extensively equipped, modern kitchen/dining room opens onto to the outdoor dining terrace. An electric, fan assisted oven, 4 plate hob, dishwasher, microwave and fridge freezer are provided, as well as a large selection of attractive table ware and utensils. There is a separate utility room with washing machine and storage. Three lovely bedrooms and two modern bathrooms are on the first floor. The master suite has a king size, 1.60cm bed and en-suite Italian shower. The second double bedroom with a 1.50cm queen size bed and is situated at the other end of the house, making it very private. The third has 0.90cm twin beds which can be made up as double. A large family bathroom with bathtub and shower is situated between these bedrooms. High quality bed linen and towels are changed weekly and the beds made up ready for your arrival. The large private terrace, planted with shade trees and flowers, enjoys beautiful views across the surrounding countryside and exceptionally lovely sunsets. The ancient stone bread oven makes a characterful backdrop and a romantic setting for relaxed mealtimes, at any time of day. Dining furniture and a charcoal barbecue are provided. The large private, salt filtered pool, (10m x 5m), heated according to weather conditions, faces the house. It is protected by gates and fully landscaped with shimmering olive trees and exotic mediterranean planting. Sun beds and parasols are provided. Wide Roman steps at one end, provide easy access for children and a place to chill out. Nearby a second dining/play area, protected by tiled roof, is situated alongside the boules terrace. The wooden table seats 10 and doubles up for table tennis. Swings and slide are situated outside the pool area. SURROUNDINGS: The house is in a tranquil, country situation but with easy access to main routes. Excellent shopping and all services are just 5 minutes away. A grocer and restaurant are in the village and fabulous local markets are all around. Excellent restaurants in all price ranges, modern and traditional abound. Close to the world famous medieval Cathedral city of Albi, a UNESCO World Heritage Site, historic Castres, hilltop Lautrec, there are numerous romantic, bastide villages like Cordes sur Ciel and historic Cathar sites to explore. Extensive Gaillac vineyards await degustation and gastronomic feasts of local cheese, charcuterie and the famous cassoulet abound. Vast resources of cultural and sporting facilities for all ages. There are three top golf courses and horse riding nearby. Beautiful rolling countryside with lakes and rivers, good walking, rare birds and wild flowers. 1 hour Toulouse, airport BA, Easyjet, Flybe, Air France. Sports: Bicycles and tennis rackets are available. Lots of space for wandering and for children to play. Miles of cycling for enthusiasts. Quad biking, canoe, adventure parks, swimming pool complexes, horse riding are all within easy reach. Lakes for fishing, boating and swimming abound. Extensive and varied walking routes for all levels. Endless opportunities for bird and animal watching and wild flower discovery. Fabulous range and light for photography and painting. DO NOTE: We can suggest SPECIAL ACTIVITIES & EXCURSIONS to suit your needs. John and I met in London 25 years ago and discovered a shared passion for food, gardens, architecture and travel. Joan is a garden designer and writer with a taste for the unusual and a taste for adventure. John, a chartered surveyor whose life has touched many parts of the world, has always enjoyed tackling 'projects'. France is country in which we both spent happy times in our youth and we thought to recapture some of that spirit. Not previously knowing the South-west, we stumbled upon the Tarn and discovered a Hobbit like romantisicm within its rolling landscapes, lakes and ancient hilltop villages. When we discovered La Bailesse, it really was love at first sight, Once the centre of a vast farm, it had been unoccupied for years and just seemed to reach out to us for help. We were so lucky to find it and our fabulous neighbours who have welcomed us into their community without reservation. This warmth extends right throughout the region. La Bailesse is a magical property nestling within the cradling arms of soft, surrounding hills. It revels in nature and is an oasis for our birds and butterflies, the red squirrels and wild orchids. Guests who might arrive somewhat stressed, quickly lose themselves to its charms and fall headlong into relaxation. The character of the architecture, the gigantic, ancient oak trees, the welcoming ambiance, the landscaped pool, the lovely views, the space and calm make this an exceptional destination. toilet, shower, Walk in Italian shower. The bright, modern bathrooms are light and spacious with quality fittings and equipped with toiletries. The large separate bathroom has a bathtub and shower over and lots of space for the family. The master bedroom has its own modern en-suite shower room/wc. High quality towels are supplied and changed weekly. Baby steps and changing facilities are available. Village with traditional restaurant, a good grocery store/delicatessen/bread/vegetables, post office. Pizza restaurant nearby. All in walking distance. High quality bed linen is provided and replaced weekly. Beds are made up before arrival. Your own washing machine in a separate private laundry room. Starter pack of laundry soap provided. Good quality towels and pool towels for use on the property are provided. TV, DVD player and library. Books and games. 2 large sofas, armchair, pouffe, desk, bookcase, coffee table. Welcome pack of local produce. Starter pack of cooking oil, vinegar, salt, pepper, herbs, tea bags, dishwasher tablets, washing up liquid, kitchen roll. Bottled water. A generous range of quality matching tableware, plates, bowls, mugs, glasses, knives, forks, spoons. Fully equipped kitchen with large range of utensils and kitchenware. Dishwasher, washing machine. Tablecloth and place mats. Novels, reference books, guides, childrens' titles. Board games and cards, also for children. DVD library, also with childrens titles. 2 acres of landscaped and wild gardens with small wood. Great for children to play and for strolling. 2 road bikes, 2 off road, 1 racing style, 2 helmets. Large covered outdoor space with dining table for 10, lighting - beside boules terrace. Large private dining terrace leading from kitchen. Dining table and chairs seats 8, barbecue. Extensive views over countryside, sunsets. 10 x 6 metre. Shallow roman steps to enter. Salt filtered, heated subject to weather conditions. Underwater lighting. This property benefits from an exceptional situation in wonderfully landscaped grounds in a rural setting with no near neighbours. As s a bonus, it has easy access for shopping and for visiting tourist attractions. We, the owners, live on site and know the area very well, so we are able to give you help and advice at any time. We live in a completely separate part of the property which is private from the farmhouse. We offer: Wi-fi internet access. A weekly cleaning service is available if required. We can make you special meals by request. Loan of bicycles. Lots of space in gardens for children to play. Books and DVD library. Pool toys. We can organise visits, rambles and sporting activities if you wish to add some extra experiences to your holiday. Just returned from a really great holiday at this lovely Gite. This was such a peaceful and restful location. Our hosts were extremely welcoming and helpful, the house was very comfortable with everything you needed. The living room was spacious with comfortable sofas to relax on in the evening. The kitchen was well stocked with cooking equipment and a BBQ was also provided. The outside seating area is great with a beautiful view across the fields and the most amazing sunsets night after night. There is plenty to do in this area - walking, cycling - including a very safe path for cycling with children which is flat and goes for miles. Lots of beautiful towns and villages with their regular markets and fabulous fresh produce to explore. A very large intermarche is just a couple of miles away and the local shop which you can walk to has fresh bread and croissants plus any other essentials you may need. A really great holiday location - the Tarn is a beautiful area. Thank you so much for your comments, we're delighted that you share our affection for this lovely place. We had a wonderful stay in Joan and John's gite in rural Tarn. It really was a get away from it all week in the middle of fields and rolling countryside, even if the weather wasn't always playing ball !! Joan was a great host and was there to answer any queries we had. Very relaxing and just what we needed. We had a wonderful holiday, the Gite is well equipped, a real home from home, set in beautiful countryside and well situated to explore the surrounding area. We visited Albi and Lautrec, and also did a walk around Hautpoul. The village shop is an easy 10 minutes walk away, fresh bread and croissants for breakfast are a must. Joan is a wonderful host, making us feel very welcome. Highly recommended. It was a real pleasure to share our home with your lovely, enthusiastic family. I enjoyed sharing sunset watching with you and was thrilled to see you swimming during the extended 'Indian summer'. You are welcome back any time. Shabby chic, white washed floorboards, exposed beams, flagstone floors, beautifully maintained swimming pool, picture perfect views, scent of lavender, vast gardens, every mod-con, comfortable beds, thick sheets and towels and when the children finally stopped jumping into the swimming pool total, ear-ringing silence! Our four children didn't want to go out and visit the area as they loved the house and pool too much! But when we did there is plenty to see. Local shop and café-bar/restaurant in walking distance. Amazing boulangerie 10 minutes drive away in Lautrec. Fantastic local market in Realmont 10 minutes in the car. The local mountain zoo was the best day out for the children. Good value, freshly made pizzas 10 minutes walk across the fields and lovely local restaurant 20 minutes walk across the fields. And a very warm welcome from the owners. Highly recommended. Thank you so much for taking time out to write ths lovely review. It's a huge pleasure for us to share this beautiful and varied area of south-west France and we're delighted that you had such an enjoyable time. Super cadre. Hôtes très accueillants et attentionnés. Nous reviendrons. C'était un plaisir d'avoir une famille si charmante qui reste ici. Ils ont montré une grande appréciation des jardins, ce qui m'a rendu heureux. It was a pleasure to have such a charming family staying here. They showed great appreciation of the gardens, which made me happy. This is a paradise area, unspoilt and unknown, hosting an incredible number of discoveries. Nearby ALBI, a UNESCO World Heritage Site, is famed for its immense 13th C rose brick cathedral, sited imposingly above the river Tarn. Next door, the TOULOUSE LAUTREC museum houses a vast collection of works by this Albi born painter. ALBI and its narrow cobbled streets rich with history, has to be explored. CASTRES, an intimate medieval market town is a short drive away. You will be enchanted with its Venetian style river frontage and formal gardens designed by Le Notre, the creator of Versailles. The Goya museum has a huge collection of Spanish art and many music festivals take place in the streets and classical churches. Fabulous local markets and restaurants cater for your culinary desires. The enchanting hilltop village of LAUTREC, 5 minutes drive, is famed for it's pink garlic, street festivals, live music, restaurants and shops to buy local blue Pastel dyed clothing and fabrics. The elegant hill-top village of CORDES SUR CIEL, with outstanding views is packed with galleries and local crafts. The famous Jardin de Paradis hillside garden is a delight. TOULOUSE with elegant architecture and museums is one hour away. CARCASSONNE, the CANAL DU MIDI, historic chateaux and fortified villages, make this a paradise for painters and photographers. Four golf courses, riding, canoeing and adventure parks invite sports enthusiasts, while walkers can explore the Haut Languedoc National Park. Other Activities: adventure parks, canoeing, rafting, swimming pools, quad, go-kart. LONG TERM RENTALS welcome in OFF SEASON - please ask for a quotation DISCOUNTS may be available for COUPLES in LOW SEASONS - please ask for a quotation Security deposit 300 Euros, refundable subject to loss or damage. Oil fired central heating supplement (when required) of 95.00 Euros per week. Logs for wood burner 25€/basket.